Our first responsibility is to feed ourselves and I think we've done a pretty good job. We have just inventoried our freezers (That's right, we have 3) and were happy to organize better than 240 items or nearly 2 years worth of food. Here's to hoping that the power stays on. We still have turkeys left from 5 - 9 lbs. $7/lb. Get in touch with us ASAP to schedule a pick up. We are processing turkeys this Sat (Nov 16) and might have one with your name on it! Let us know if you want one ASAP. First come first served. Birds will be ready for pick up Sat evening 6p-7p at Appenzell Farm (1146 E 4400 N, Hyde Park) or Sun 10:30 - 1:30 at our farm (697 W 100 S, Logan). We're asking $7/lb and will have birds ~9-15lbs. If you'd like to earn your turkey through work share, we're looking for a couple extra hands Sat and would provide a turkey in exchange for the help. We can train anyone eager. We've got plenty of eggs available, too! $3 doz or $7 for 2 doz. The journey of chicken to food . . . in limited sanguinary details. We try to be very forthwith when we describe why we got into the farming business. We are working to support a food system that promotes biological diversity and cultural autonomy. We believe that can be best accomplished by what might be called "voting with your dollar." That means making purchases and economic decisions that reflect the world you feel ought exist in the future. So goes the push to buy groceries from a farmers' market or investing in clean energy technologies. We started our journey by going vegetarian for a few years to conserve environmental resources. We then went "locavore" after reflecting on transportation costs and the systematic idiosyncrasies of alternative vegetable production (e.g. organic tomatoes commonly come from the desert of Baja California); not to mention, we very much missed omnivorous dishes of our European and Hispanic heritage. We found local, pasture-fed animal products were prohibitively expensive for our student budget so we took on the production ourselves. And so we've found ourselves living the farm life with all the responsibility, humility, and gory details that come along with such a lifestyle. We've included the preamble to justify our practice of slaughtering animals, though we prefer to say "process." Our respect for animals and their intimate relationship with humans has only been strengthened with this experience. The way we raising chickens (or any of our animals) and the subsequent processing into food is a result of that respect and our practices reflect that. If you chose to read on, you will be exposed to the whole act of making chicken into food. We hope that you can learn something about raising animals. It all begins with keeping the chickens safe and well feed. These "rangers" are ready for processing at about 16 weeks. Up to that point we keep them on pasture with a grain supplement in the evening to promote growth and flavor and to get them back into their shelter at night. When their ready for processing, we withhold feed for a day and then round them up. These crates are used for ease of transportation and extraction at the processing facility. The birds are then extracted from the crate and loaded into a killing cone. Being held upside-down promotes calmness in the bird and rapid bloodletting through a cut in the carotid artery. Most importantly, this method is acknowledged as the quickest and most humane way to dispatch a bird. The steps after death must be completed as quickly as possible in a sanitary environment followed by rapid cooling to avoid spoiling and the spread of pathogens. Scalding the bird in soapy water loosens the feathers for plucking. Depending on the age of the bird the water is set to 145 - 160 degrees F. Too little scalding will result in difficulty plucking or skin tears from pulling too hard, while too much scalding will result in skin tears from weak skin. Plucking can be done by hand (15-30 min) or with a machine (30 sec - 5 min). Cleaning and eviscerating is where the skill is involved. Feet, head, neck, and entrails are removed. Organs (i.e., liver, heart, and gizzard) are separated if desired. We don't really recommend doing this on your own for the first time and have left further details out for our casual reader. If you want to give it a go anyway HERE is a pretty good step by step guide from backyardchickens.com. As a plug, we have plans for a processing workshop with sufficient interest, so message us if you want to see that happen! Some of our birds go right into packaging whole, though roast chicken gets old after a while. We do cut-ups of the rest. Can you name all of the parts? Thanks for sticking through to the end! We hope your knowledge is empowering. It has certainly been a rewarding experience for us. All energy we consume (i.e., food, gas, electricity) ultimately comes from the sun. Even fossil fuels were once ancient plants or animals that were preserved underground in such a way to allow for energy conversion today. 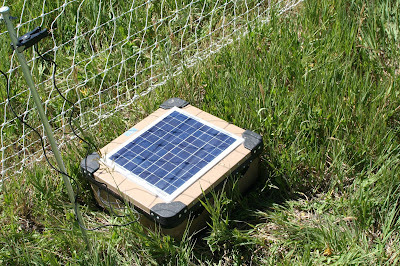 Up to now, gardening has been our primary means of converting solar energy into a usable form. Bringing lambs, broiler chickens, and more turkeys onto the farm has required that we scale up our fencing infrastructure. We chose an electric fence, and are proud to be running it on a solar panel. It's just a start, but we hope to include other alternate forms of energy production on our farm in the future. One part of sustainability that we feel strongly about is reducing our waste. (See how we made that happen in our wedding HERE.) That means making the most of all the inputs and products on a farm. One skill I have been working at is tanning hides to make leather. My first attempt was with a lamb skin (wool on) that turned out pretty stiff. It will only ever function as a rug. My second attempt with a goat skin (hair on) worked out much better. 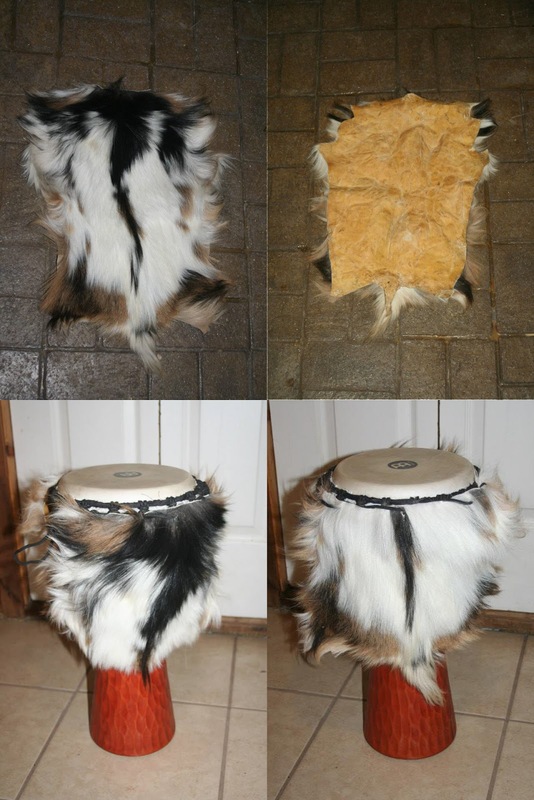 As the pictures show, I was able to make the skin leather enough to wrap around my wooden djembe. I used wet scrape method, salted the hide, then softened with an egg yolk solution. We'll see how well the hair holds. My ultimate goal is to make a pair of buckskin gloves. We'll see how long it takes me to get good enough at the process. In the meantime, it'll be pretty exciting just to not have to throw away such fine looking hides. This evening, while doing chores, I saw an unexpected little baby goat in the pen and was about to sound the alarm for an escapee. Instead, I realized that it was a moist newborn kid of Callie's! Callie only gave us one baby last year, which by expectations means she would only have one baby this year. We ran to her side to congratulate her and make sure everyone was healthy to find her giving birth to another. That's right, we got to see the birth of a baby goat. Unfortunately, the story doesn't end here. Callie wasn't quite done. She tried to give us a third kid, which came out still. All of this excitement in less than 20 min. Despite some hardship, we are pleased to welcome a baby boy and a baby girl from mother Callie! They are safe and warm in the kidding shelter next to Millie and her kids. Expect pictures and an update of the four kids soon! 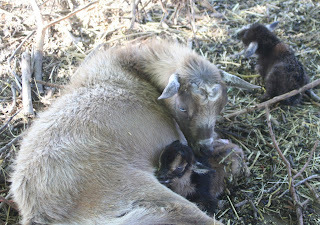 After much speculation, our first kids of the year were born Friday June 7th. 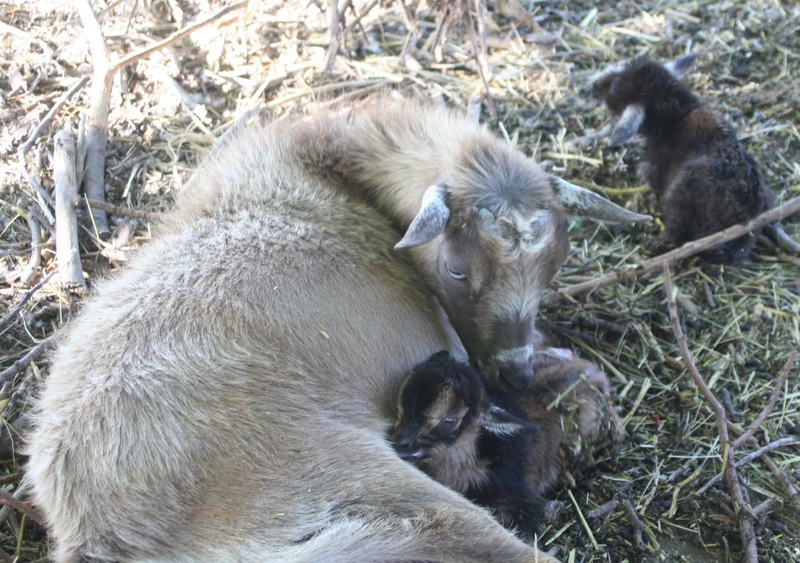 Millie gave birth to twin male goats at around 6 a.m. These little guys are tri-colored with all sorts of spots. So far they don't do much besides eating and sleeping, but we expect to see them prancing around the farm and creating all sorts of mischief in no time. We expect Callie to kid sometime this week. Now we can finally look forward to fresh goats milk and cheese again on the farm. Look for more updates to come! Chicks and Ducklings and Turklets, Oh My! In our efforts to expand our operations this year, we have been absolutely overrun with chicks, ducklings, and turklets (note: this is not the technical name for baby turkeys, but our own personal moniker). And this is just the beginning. Right now we have 25 red ranger chicks, 15 laying chicks, 18 ducks of various varieties, and 18 turklets. Several brooders in our brooding room. This little turklet is exhausted. of animals this year and will even be testing a small flock of guinea hens starting this June. If you are interested in free-range, pastured chicken, duck, or turkey, feel free to check out our "items for sale" tab later this Spring. We're all ready for market season to start! Cache Valley Garner's Market opens THIS Saturday, 11 May 9:00a. We've got at least 17 1/2 doz chicken and 8 doz duck eggs ready for sale. Get to the market early to be sure you get your pack. Shish, Kabab, Gyro, and 24.
our first year raising lambs long term (we "raised" one for a a month or so last year) and so we are learning all of the ins and outs of raising sheep. As it turns out, it's not too different from raising goats and so luckily we have almost everything we need. This weekend I get to play amateur veterinarian and administer tetanus shots all around. Poor Zack gets to play amateur assistant, which generally involves holding disgruntled animals while I do the easy parts. He also gets to be our amateur livestock wrangler. Han Solo (our border collie mix) is not quite up to the task of corralling all the sheep and goats yet, but he is learning. In other news, the goats are pregnant and due in May/June. "How do you know they are pregnant?" you might ask. Well, first of all, just look at 'em. They are rotund. Second, if you know where to feel, you can feel those little kids moving around inside of them. No ultrasounds for these ladies, just good old fashioned stethoscopes and know-how. Stay tuned, other baby animal news coming soon! We are very fortunate for the strong support we have for our farm from friends around the community. One customer in particular stands out for his excitement about duck eggs. Last year, when we began selling eggs at the Cache Valley Gardener's Market we put a sales promotion on the back of our business card. You earned a free dozen for buying six. The card worked to get return business as we expected, but very few people continued using the card. This particularly awesome customer did not give up and just earned his second free dozen this week!!! Many thanks to you and those who have supported our farm! Although we are no longer run this promotion, we are back in spring production. We have both chicken and duck eggs available and will be selling again at the Gardener's Market May 11. 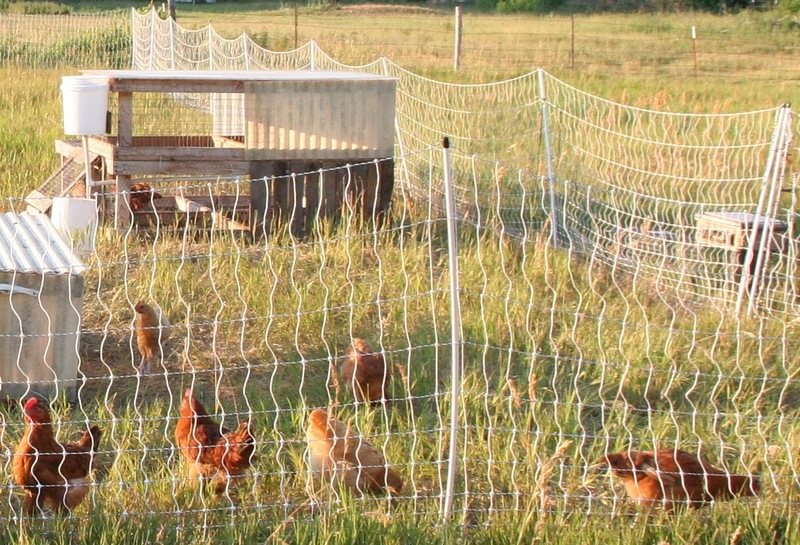 We isolated our roosters with their respective ladies to keep some true breeds on the farm. We anticipate chicks hatching within the next month or two. We have collected the first dozen duck eggs of the year! Spring must be here. We'll be selling them immediately as they get laid.